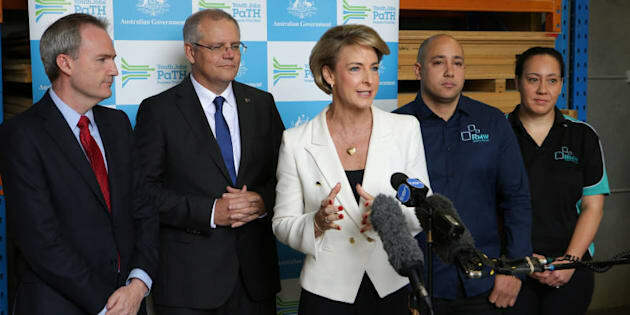 The national launch of the PaTH employment program with Scott Morrison, Michaelia Cash and David Coleman. CANBERRA – A voluntary internship program, designed to get young people eventually into work, has just been kicked off by the Turnbull Government despite widespread concern about its efficacy and potential for youth exploitation. Under the Youth Jobs PaTH Program, an unemployed or disadvantage young person under 25 years will be paid an extra $200 a fortnight "incentive" on top of the usual income support payments to complete an internship of between four to 12 weeks. Unions describe the program as "deeply flawed" and "free labour". While it is not quite free, the $200 a fortnight works out to be $4 an hour. And the program is being rolled out despite the legislation to support it being blocked in the Senate, surprisingly by One Nation because of concern over excessive payroll tax. If the legislation is not passed, then that $200 will be taxed as income so that young person will receive even less. At a time of high youth unemployment, the Turnbull Government claims the Youth Jobs PaTH program will assist 120,000 young Australians by helping them "gain real world experience". "This program is all about getting our youth off welfare and into work," Employment Minister Michaelia Cash told reporters in Sydney. "This Government fundamentally believes the best form of welfare is a job." Businesses partaking in the program will receive an upfront bonus of $1,000 for taking on an intern and get an additional $6,500 if the internship turns into a job. "It's all about business working together in hand with young people and the community to ensure young people can get themselves into a position where they can get a job and they can keep a job," Treasurer Scott Morrison said on Monday. "They can get an apprenticeship, they can get a traineeship, they can get a long-term job. "Because once they have a job, they have choices. When they're on welfare, they don't have those choices." The likes of Labor, The Greens, Interns Australia, Uniting Care, Anglicare, the Australian Council of Trade Unions (ACTU) and Jobs Australia have also raised doubts about the program. The ACTU believes the PaTH program will displace "real" jobs and, in the end, do little for youth unemployment. "This is a program which runs contrary to everything we know works best to address youth unemployment and skills shortages," said ACTU President Ged Kearney. "We know that young people need affordable education, real qualifications, and investment in apprenticeships, traineeships and cadetships to help them into full time, ongoing work." The Youth Jobs PaTH program rolls out in April.